Retailers who think 'going green' is just another fad or marketing ploy should think again. Consumers are becoming more aware of their overall impact on our communities. Shoppers are developing more of a green attitude as a way of life and retailers need to be there to meet those needs. By implementing sustainable practices, retail businesses can become more efficient and save money in the process. The small business owner may think the cost and trouble of going green aren't worth the return, but the fact is each eco-friendly idea retailers adopt can make a huge difference to our planet. Now that the decision to go green has been made, where to start? First, contact the local utility company to request an energy audit. Many companies offer an audit at no charge and provide recommendations of ways to reduce costs. Next, take the list of recommendations and create a plan of action. Examine each area of store operations to determine what processes should be changed and how. 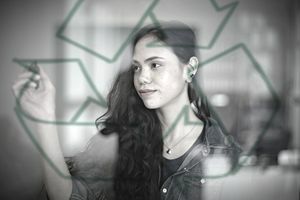 Here are a few ways retailers can reduce, reuse and recycle for improved social-responsibility. Recycle paper, plastic, aluminum, ink cartridges. Reuse packing materials and cardboard boxes. Use double-sided printing when possible. Reduce paper transactions by going digital for bill payment, vendor orders, invoices, online banking, e-mail and faxing directly from your computer. Eliminate disposable cups, plates, and utensils in the break room. Replace with permanent dishware. Switch to rechargeable batteries. Large office supply stores even have collection centers for recycling dead rechargeable batteries. Use eco-friendly cleaning products that are biodegradable and non-toxic. Purchase energy-efficient PCs, printers, and other equipment with the EnergyStar label. Donate or recycle old computers and equipment. Keep up with regular maintenance of all mechanical equipment. Call a store meeting and share the new business practices with staff. Solicit input and offer employees incentives for submitting green ideas. Reward those staff members that walk, bike or use other alternative methods to get to work. Use ceiling fans to reduce the use of air conditioners. Insulate hot water heaters and lower the temperature. Switch to low-energy lighting and compact fluorescent bulbs. Put outdoor lighting on timers. Install air hand dryers in the restrooms. Use low-flow toilets and urinals. Set PCs to power-down when not in use. One of the biggest environmental issues encompassing the retailer is the use of plastic bags. Paper may be better for the environment but the plastic vs. paper debate continues to leave retailers without an ideal ecological choice when it comes to disposable shopping bags. To provide shoppers with a low-cost, green solution consider selling reusable bags at cost. Other shopping bag options include products made of industrial post-consumer materials. Certain retailers, depending on the type of product sold, may want to skip the bagging. Many booksellers have opted to forego shopping bags. Once you've begun to practice sustainability, don't keep it a secret. Be sure to announce your new green initiative to customers, staff and even vendors. Let them know the store is committed to saving the environment making responsible choices.